A book alleging a “deep state” plot against Donald Trump has become a best-seller on Amazon, leaving some to speculate that attempts at shaming and silencing ‘QAnon’ followers have only galvanized the conspiracy theorists. The QAnon anthology rose to the top of Amazon’s “censorship and politics” category, even as media outlets and news networks slammed the conspiracy as dangerous and deluded. Ironically, the book may owe its success to attempts to deplatform and silence conspiracy theorists – the most notable example being Alex Jones, whose popularity shot through the roof after being kicked off of Facebook and Twitter. ALSO ON RT.COMMike Pence sparks QAnon theories after deleting tweet featuring badge“Bans on social media only strengthen the conspiracy theorists because they say, if it wasn’t such a terrible thing that we’ve discovered, they wouldn’t be hiding it, they wouldn’t be suppressing us,” Oren Amitay, a psychologist and media commentator, told RT. 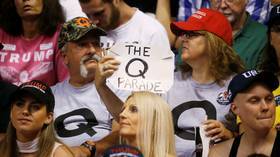 Don Courtier takes a deep dive into the shadowy world of QAnon blowback. Even RussiaToday is playing silly buggers by using up different clips of Alex Jones in a way to try to make him look stupid when the man is far from stupid. This shows that RT also has it’s own agenda so its not 100% trustworthy in his methods but just a lot more trustworthy than Western media.